Apologies for the quality since this was taken through a coach window. 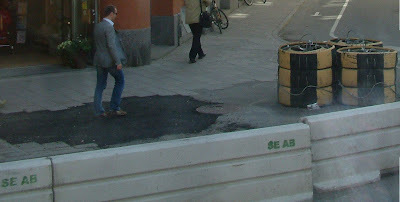 These roadworks were on one of Stockholm's main thoroughfares. Someone is stepping over newly-laid tarmac. The sidestreet is blocked off. What puzzles me is the three sets of tyre-walls. Are they makeshift rubbish-bins or what? I suppose it's just that - a tyre wall. Making the ride slightly smoother for drivers who have difficulties navigating - or rather steering - through the city.